A simple yet amazingly delicious Mauritian-style macaroni fricassee with dried bean curd sticks skins (tofu skin or yuba). If you like scrambled tofu, you might just like this one. 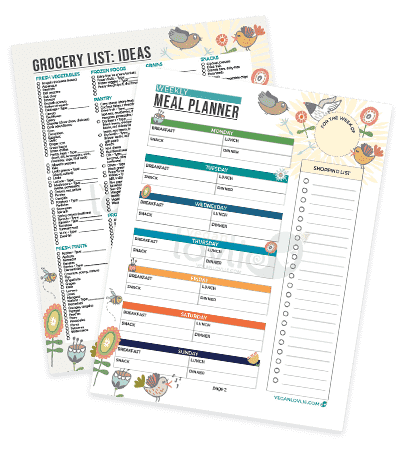 What I find fascinating about the way people prepare food is the similarities yet distinctions with which every household make their meals, especially the traditional ones. One of those dishes is the macaroni fricassee which is typical in a lot of Mauritian households. Across the globe, pasta is enjoyed by far and beyond the Italian frontier whereby each culture has pretty much adapted this much loved food into their own local culinary culture. 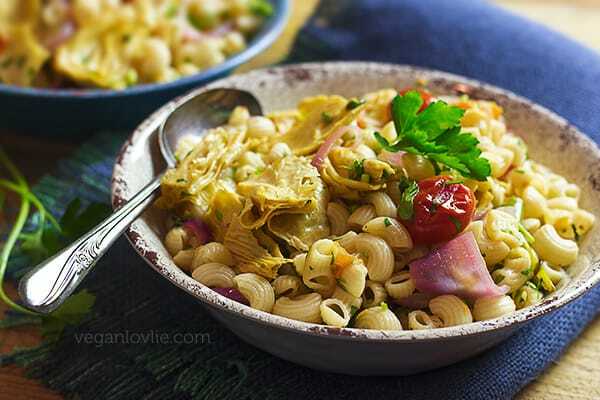 The quintessential Mauritian style macaroni dish is one which is sauteed with onions, garlic, fresh herbs and eggs scrambled into the whole mix. This is either served on its own or accompanied with a sauce topping of some sort. To recreate this delicacy while still keeping its essence, Kevin has substituted the eggs with tofu skin which rivals the original dish up to par. So, what is tofu skin? If you are unfamiliar with the term, tofu skin is also known as bean curd skin, yuba, bean curd sheets, bean curd robes or fu zhu. It is a skin or film that forms on soy milk as it is boiled in a shallow open pan. This skin is collected and dried into yellowish sheets or sticks. 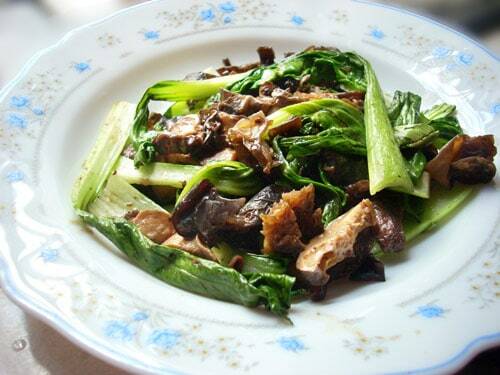 While bean curd skin is not considered tofu, it does have a similar taste. Texture-wise, I personally find it to be quite different to tofu; it is a little firmer and chewier. 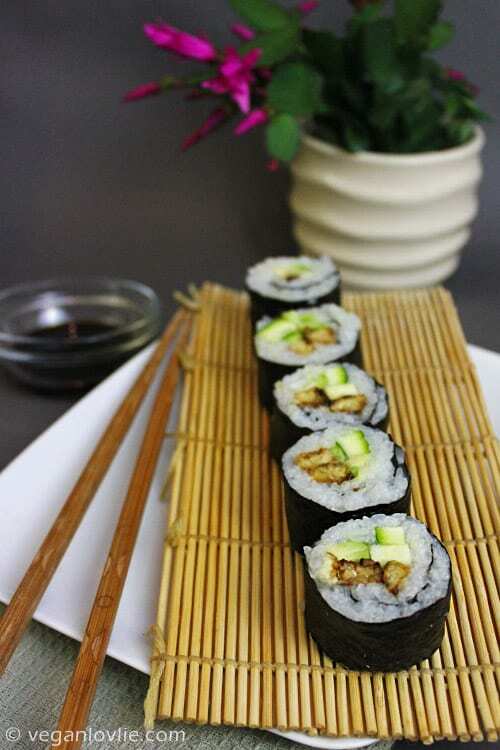 Tofu skin is used in many preparations ranging from dumpling wrappers, congee to mock chicken. 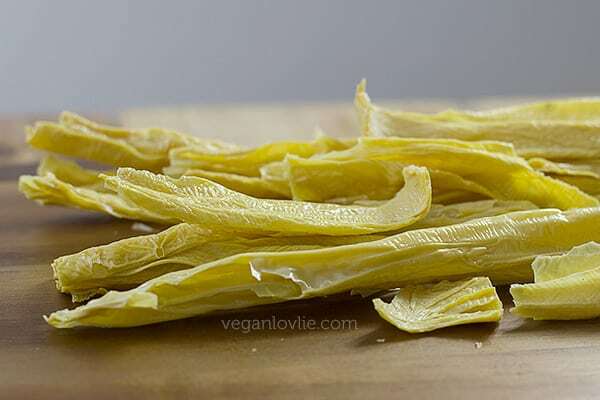 I get these tofu skins in the dried version in the form of sticks or sheets at my local Asian store. I have often seen fresh yuba being sold in the refrigerator sections but they do not always have them. I find the dried version to make good pantry staples though. This recipe would work well with firm tofu too if you cannot get hold of tofu skins. Contrary to the creamy white roux-based sauce that is typical of a fricassee dish, the fricassee style in this particular recipe is more along the lines of a saute. 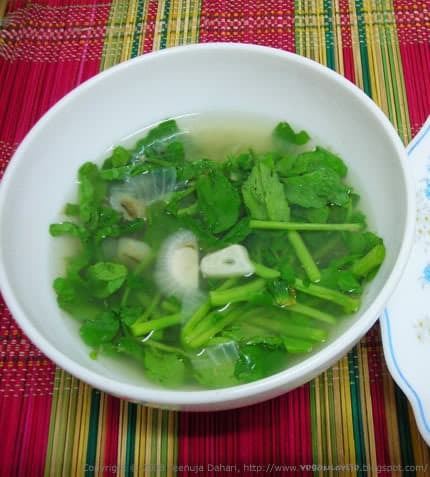 It is basically vegetables sauteed in various seasonings like onions, garlic, herbs depending on the recipe. This sauteed macaroni dish is a very simple recipe but trust me, it is one of the most satisfying meal you could have. 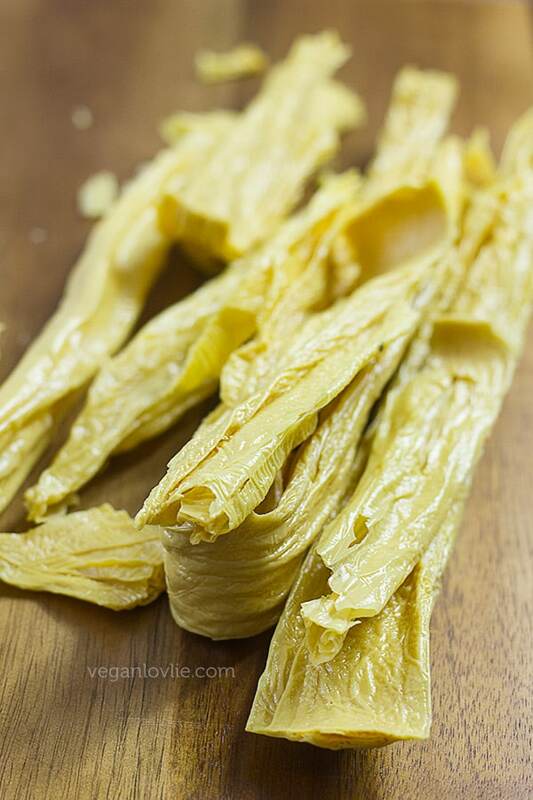 It does require some ahead of time planning as the dried bean curd skins need to be rehydrated properly before using them in any recipes. It is best to soak the sticks in hot water for at least 2 hours in hot water (or overnight) before using. Kevin has used gluten-free brown rice macaroni but any macaroni of choice will do. We strongly suggest using fresh herbs like thyme and parsley for the invigorating and refreshing aroma that mingles with every morsel of pasta and yuba. For a little twist on the traditional dish, Kevin has tossed in a handful of whole vine-ripen grape tomatoes lightly braised for some added juicy texture and lush sweet flavour contrasting with the mild sourness of the Roma tomatoes. 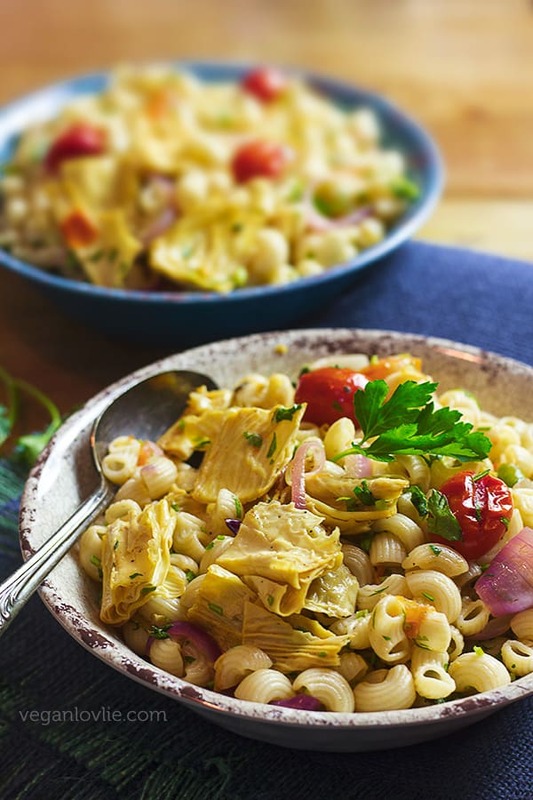 Watch the recipe video for the easy step-by-step process on how to prepare the bean curd skin and this delicious macaroni dish. Break the bean curd skin sticks or sheets into rather large pieces that will fit into a large mixing bowl. Immerse them in hot water and leave to soak for at least 2 hours (or more). Note: You can actually soak them overnight if this is more convenient for you. Then transfer the sheets to the refrigerator until you are ready to use them later in the day. Bring a large pot of water to boil. Drop in the macaroni and boil until al dente according to packet instructions. Once boiled, drain the pasta and rinse with cold water to stop the cooking process immediately and remove the excess starch. We are going to saute the pasta, stir-fry style, in this recipe so the residual starch won’t be ideal and may render them rather sticky. Once rinsed, add a drizzle of olive oil and toss to mix it in. This will prevent the pasta from sticking until we are ready to use them. While pasta is boiling, prepare the rest of the ingredients. Slice the onions into half moons. Finely chop the garlic. Dice the Roma tomatoes and finely chop the parsley. 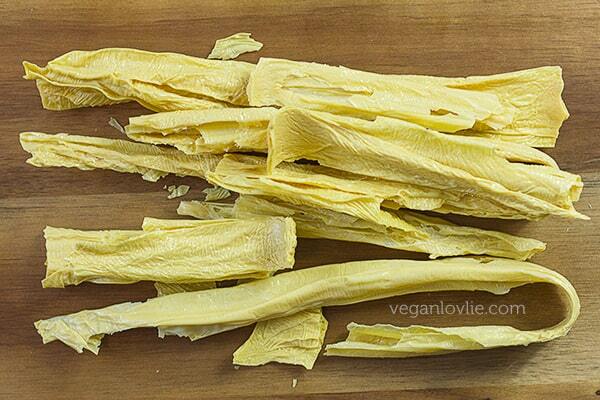 Cut the bean curd skins into pieces of about 5 cm (2 inches) in length. In a non-stick wok on medium high heat, add about a tablespoon of coconut oil. Toss in the grape tomatoes first. Add a pinch of salt. Saute for a few minutes until tomatoes start to light char. Remove from the pan and set aside. Add in a little more oil if required, then add in the bean curd skins. Add the soy sauce and stir-fry for about 4 – 5 minutes. Then, remove from the pan and set aside. Add another tablespoon of coconut oil in the wok. Then add in the garlic. Cook for about 20 seconds, then add in the onions. Toss and stir fry for a few minutes until onions start to soften. Next add in the Roma tomatoes, followed by the green chillies and a little black pepper. Add a little salt and thyme leaves. Stir fry for about 5 minutes until tomatoes have softened. Add in the macaroni, stir and mix well. Stir fry for a couple of minutes then add in the pre-sauteed bean curd skins followed by the pre-cooked grape tomatoes and chopped parsley. Adjust salt and pepper to taste if necessary. Stir fry for a couple more minutes, then turn off the heat. The macaroni fricassee is ready to serve. An easy yet amazingly delicious Mauritian-style macaroni fricassee with dried bean curd skins (tofu skin or yuba). This dish can be enjoyed on its own or as a base with a sauce topping. Once boiled, drain the pasta and rinse with cold water to stop the cooking process immediately and remove the excess starch. We are going to saute the pasta, stir-fry style, in this recipe so the residual starch won't be ideal and may render them rather sticky. Once rinsed, add a drizzle of olive oil and toss to mix it in. This will prevent the pasta from sticking until we are ready to use them. Add in a little more oil if required, then add in the bean curd skins. Add the soy sauce and stir-fry for about 4 - 5 minutes. Then, remove from the pan and set aside. I bought some tofu skin out of curiosity without knowing what to do with it. Now i have the solution, thank you!